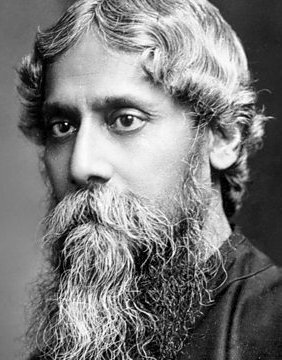 Rabindranath Tagore (1861-1941) was a Bengali author, poet, essayist, playwright, novelist, composer, and painter. He won the Nobel Prize in Literature in 1913, the first non-European to do so. Where the Sadar Street ends, trees in the garden of Free School Street are visible. One morning I was standing in the veranda, looking at them. The sun was slowly rising above the screen of their leaves; and as I was watching it, suddenly, in a moment, a veil seemed to be lifted from my eyes. I found the world wrapt in an inexpressible glory with its waves of joy and beauty bursting and breaking on all sides. The thick shroud of sorrow that lay on my heart in many folds was pierced through and through by the light of the world, which was everywhere radiant. I thought I might have a fuller vision of what I had witnessed… if once I reached the heights of the Himalayas. But when I reached the Himalayas the vision all departed. That was my mistake. I thought I could get at truth from the outside. But however lofty and imposing the Himalayas might be, they could not put anything real into my hands. But God, the Great Giver, Himself can open the whole Universe to our gaze in the narrow space of a single lane. How is it that this morning the sun’s rays enter my very heart! How comes it that early bird-song pierces today the cavern’s gloom! I do not know why, but after so very long my soul is awake. The heart’s pain, and its passion, I can no longer hold in leash! The mountain shivers in every pore and rock on rock rolls down. The water foams and fumes and in pent-up anger roars. Like mad, it moves in boisterous endless rings, rushes blindly at the dungeon-door it cannot see but wants to break! Why is God so stony? Why these barriers all around? Awake today, my heart, and win fulfilment. Break, break into bits the boulders in the way! Let blow rain on blow as wave rumbles after wave! When the soul is aglow, who cares for this rampart of gloom or the hurdle of stone? What in the world is there to fear when the waters of desire overflow its shores? I’ll break this prison-house of stone and flood the world with the waters of compassion! I’ll pour myself out in mad fervid songs, flashing the bounty of my hair and weaving bouquets of bloom. I’ll float in the air my rainbow wings and drain my heart to print a smile on the fleeting sunbeam. I’ll rush from peak to peak, and sweep from hill to hill, and laugh and chant and clap to my own measure. I have so much to say and to sing,—my heart so crowded with desire and bliss. I know not what happened today, but my heart is awake and from afar I hear the ocean’s roll. Why around me this dark prison cell? I’ll rain blow on blow and break, break, break its walls: for the bird-song is in my ears and the sunshine in my eyes! It was inexpressible, ineffable, indescribable. Far too much to ever express, say or write (even through ecstatic verse).